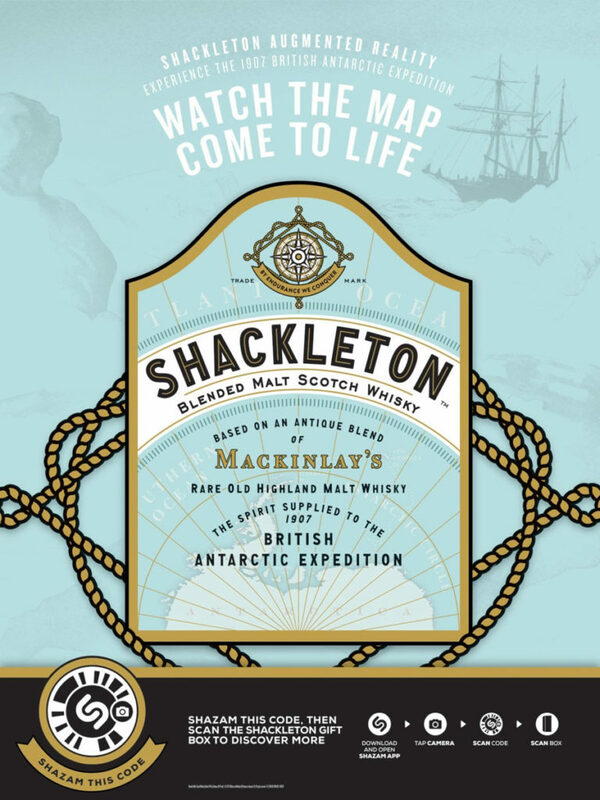 Shackleton Whisky, created to honour adventurer Sir Ernest Shackleton, is launching Shackleton Augmented Reality (AR) in partnership with Shazam. Shazam, which originally launched as a music identification app, has grown into a content distribution platform with Shackleton Whisky as one of its first brand partners. The environment comes to life on the Shackleton Gift Box, and users can simply download the Shazam app, tap the camera icon, and scan the code on ‘peel to reveal’ stickers on the gift box to experience Sir Ernest Shackleton’s1907 British Antarctic Expedition. On this expedition, whisky was left behind at Shackleton’s base camp, where it sat frozen for over 100 years, before being rediscovered, and reimagined into Shackleton Whisky. The Shackleton AR environment transports consumers into a 3D Antarctic experience featuring actual time period footage of Sir Ernest Shackleton, following key moments of his journey. He took the bravest men he could find and 25 cases of Mackinlay’s Old Highland Malt Whisky – with the aim of being the first to reach the South Pole. The experiences also chronicle Shackleton’s legendary leadership, choosing the safety of his men over his own personal glory. With the pole under 100 miles away, Shackleton chose to turn back, and remarkably returned all of his men home safely. Returning home as a heroes, Sir Ernest Shackleton and his crew made headlines around the world for breaking all records by reaching 88 degrees south. ‘Discovered Under Ice, Served Over Ice’ tells the journey of Shackleton Whisky itself. From the discovery of 11 intact bottles of the original Mackinlay’s that sat frozen for over 100 years following the events of 1907, to Master Blender Richard Paterson analysing the antique liquid and creating a new modern Scotch, Shackleton Whisky captures Sir Ernest Shackleton’s sense of adventure and bold character. Software developer Zappar was instrumental in taking this epic tale and adapting it to modern day by utilising ZapWorks and 3D Studio Max cutting edge technology. Virtual Reality (VR) glasses do not need to be used for the optimal VR experience. The Shackleton environment has been optimised to work on both Android and iOS devices in the Shazam app. Shackleton AR launched January 2019 and is available throughout the rest of the year.